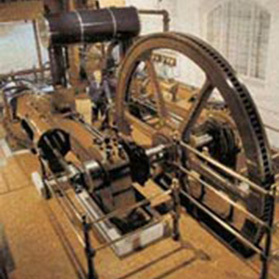 The Waddon Pumping Station at Croydon, Surrey, had the distinction of being the last waterworks in Britain to have a reciprocating steam engine in commercial operation. Its two pumping engines were finally shut down in 1983. The older engine (No.1) was presented to the museum by Thames Water and was dismantled and moved to Kew Bridge in 1984. The Waddon engine was built by James Simpson & Company in Pimlico in 1910 and so is our joint youngest engine, sharing the title with the Triple. It is a cross-compound engine, the high and low pressure cylinders being placed horizontally, with the flywheel between them. They are connected by a receiver, which can be seen above the two cylinders. This engine drives two sets of pumps – dual bucket pumps, or well pumps, which are driven from a tail rod connected to the low pressure cylinder’s piston rod, via a bell crank; and a force pump which is driven from a tail rod connected to the high pressure cylinder’s piston rod.